Most of the readers must have seen 'For dummies' books in a book shop. 'For Dummies' is an extensive series of instructional/reference books, which are intended to present non-intimidating guides for readers new to the various topics covered. Despite the title, their publisher has taken great pains to emphasize that the For Dummies books are not literally for dummies. The series has been a worldwide success with editions in numerous languages. The situation in Singapore was particularly bad in the month of June 2013. Haze is just air pollution and is also measured by Pollutant Standard Index or PSI. If PSI remains below 50, the air is considered normal and healthy. For PSI values around 100, one starts noticing it and above 300 it is called hazardous with any outdoor activity considered risky. On 17th June 2013, PSI crossed 100 in Singapore. Since this happens every year, people were not much worried. But this year it turned out to be exceptionally bad. PSI went within two days to 350 level and then above 400. At this value of PSI, the advice is to stay indoors. I still remember those hopeless stuffy days when I was forced to stay indoors for 3 or 4 days with PSI hitting 400. The general feeling was as if someone is choking you all the time. Surgical masks sold at a premium in Singapore on those days. The usually bustling city just shut down. The roads became devoid of traffic and pedestrians, with everyone preferring to stay indoors. The Singapore haze and city shut down was caused by Indonesian palm growers across Malacca straits, trying to light fires to burn foliage growing on their lands. Since the land on which they grow their palm trees have peat layers just below surface, the fires when lighted, continue to burn till rains can extinguish it. 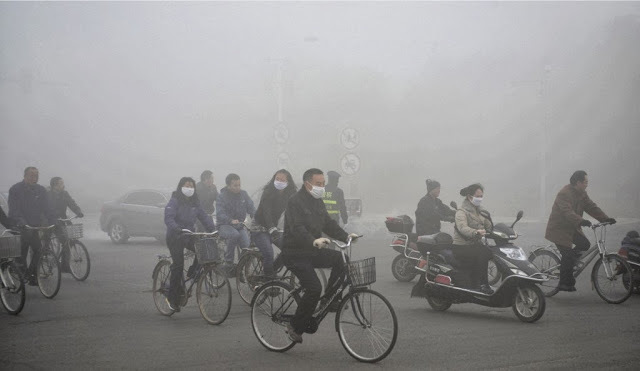 Though Singapore people had no hand in this calamity brought over to them by winds, there are other cities in the world, which bring upon a smog on themselves with resultant shutdowns. 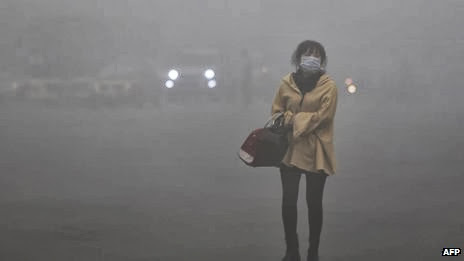 In the city of Harbin, , the gritty capital of northeastern Heilongjiang province and home to some 11 million people, heavy smog with a PM 2.5 index (used to measure the amount of particulate matter smaller than 2.5 micrometres in the air,) exceeding 500 micrograms per cubic meter, descended on the downtown area on morning of October 21, 2013, with Cars and buildings barely visible in the smog that had shrouded Harbin. 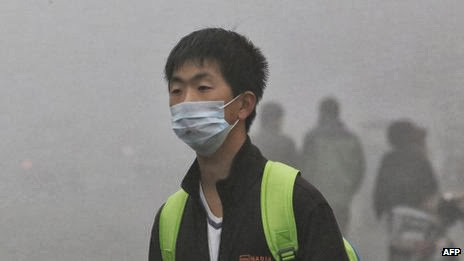 This Choking smog all but shut down Harbin, one of northeastern China’s largest cities on Monday, forcing schools to suspend classes, snarling traffic and closing the airport, in the country’s first major air pollution crisis of the winter. By afternoon on same day, the PM2.5 index reached a reading of 1,000 in some parts of Harbin. Visibility was reportedly reduced to 10 meters. According to Xinhua News Agency, the highest red alert was issued for heavy smog in several cities in Heilongjiang province on this day as it was the second day of heavy smog. Local media say that this alarming pollution level has been caused by the city switching on its public heating system for winter. All of Heilongjiang province's highways, bus services and the Taiping International Airport in Harbin were forced to close. "Beijing, you're no longer alone. You have us too now,"
"My mother called... and asked how the air in Changchun was, and if I was coughing. I feel ok, I should be able to live to see my graduation." "We were all late for class today because we couldn't find the academic building,"
For China’s stability-obsessed leadership, Air quality in Chinese cities is an issue of increasing concern as it just boosts the popular resentment over political privilege and rising inequality in China. Domestic media have already run stories how Government officials enjoy in their homes expensive air purifiers and how special organic farms supply vegetables to communist party cadres so that they need not risk suffering from recurring food safety scandals. The government has announced plans over the years to tackle the pollution problem but has made little apparent progress. In Singapore, the haze was caused by Indonesian palm tree growers, in China the smog is caused by fuel burning to heat the city. In both cases the reasons behind the pollution are different yet both are man made. The reasons may be differing but the result is precisely the same. Nevertheless, you can see how easy it is, to shut down a city, even dummies can do it. Similar problems happened in Mexico City many years ago, and I remember that they installed many huge fans to blow away pollution! I wonder if Singapore can do the same thing and disperse the pollution away to sea, or better yet(?) back to Indonesia!